VisualTrader features a patented display which allows you see the moves across a broad array of stocks as they happen. This view is also idea for traders who utilize group rotation strategies and are looking to trade a varied list of stocks. Some people say there’s no such thing as a Perfect 10. But when you see VisualTrader 10 in action, you will agree that sometimes there is. 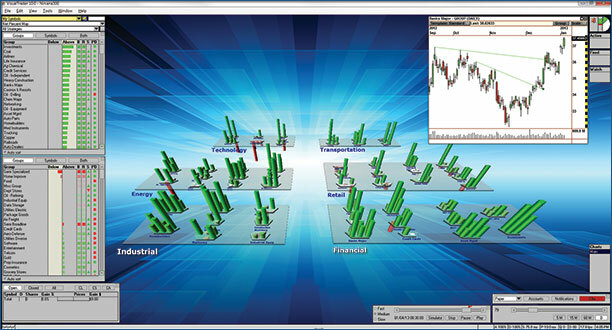 VisualTrader 10 is totally Customizable - from Look and Feel to Map Organization. VisualTrader has a new look. Everything about the Map and other elements are adjustable, including color, shading and shape of the elements. You can even add your own personalized background image. But that’s just the opening act. You can now organize groups in logical areas we call Sectors—making it easier than ever before to organize your view of the market. Arrange them in any way that makes sense to you, and easily move them around on the playing field. It’s the ultimate customization feature. Nearly everyone with a smart phone has specific tones for things like email, text, or phone calls from mom. We don’t have to look at the screen to know what is happening. The tone tells us. VisualTrader 10 has new, advanced audio alerts. You can select different sounds for different Strategies, Chart Patterns, or Indicator Formulas on any Symbol or group of Symbols. Accumulated sounds tell you when similar events are happening. As you use VisualTrader 10, your brain will begin to discern patterns and your trading will improve. In VisualTrader, the Profile (or Map) is a representative view of the market based on a specific list of symbols. As powerful as the Map is, we know there are thousands of symbols outside this field of view. What if we could literally prospect the ENTIRE MARKET each day for the specific Setups we want to trade? VisualTrader 10 supports MarketScans, our new scanning tool that finds Setups in End-of-Day or Real Time. Just select a Scan that finds specific Setups (like New Highs) and watch as a Group Plate in VisualTrader populates with new opportunities. Then, wait for a Signal or Pattern to fire. You will quickly see why we call this the Money Ball. VisualTrader 10 sharpens and focuses the original design of VisualTrader into an incredibly powerful, money-making machine. With new Map Organization, Audio-Visual Alerts, and MarketScans Integration, this new VisualTrader is going to make a huge difference in your trading. For the upgrade, we have updated the video seminar Making Money with VisualTrader to focus on how these new features work together to empower you as you trade the markets. And it’s included with VisualTrader 10.